Become a member of our Wine Club. Earn discounts, reward points, premiums and inside tips. Benefit from the insight and knowledge of our professional wine team. It will make enjoying wine much more fun! Receive an Alexander’s Wine Bag. Get automatically signed up on our Rewards Card program. Awarded 250 bonus points on your reward card. 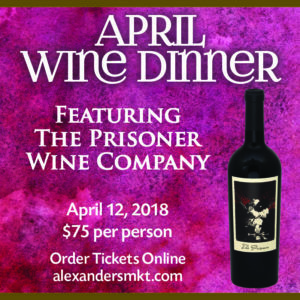 Buy all Wine Dinner tickets at a 10% discount. Become eligible for our Monthly Wine Giveaway. Earn Priority status receiving first opportunity to purchase Limited Allocation products. Placement on first notice of new buys and suggested picks. Access to quarterly packages of 6 unique red wines and 6 unique white wines featured on our quarterly wine dinners at discounted prices.